Sun & Climate only offers high efficiency boilers that have the most advanced technology, so they can save up to 40% of fuel. They use fossil fuels -gas or diesel-, and can be very well integrated in any already working heating system. They work with gas and reach a PCI efficiency of around 109%. Compared to conventional boilers, up to 40% savings can be achieved. The key to such high efficiency is their ability to cool the exhaust gases until condensating them, a procedure that cannot be done with any other type of fuel, due to the danger of corrosion. Condensing boilers only work with gas. Their advantage resides in using the residual heat from the gases generated for heating. They are more compact in size than other boilers of similar power, allowing the optimization of living space. The gases from the boiler are expelled to the outside at a temperature of between 150ºC and 200ºCº; condensing boilers utilize this residual heat for heating and the exhausted gas comes out at only 55ºC. This represents a savings of 11% on fuel. This is the reason why the efficiency of these boilers is 106% compared to conventional ones; that is not because they generate more energy than that carried by the fuel, but because conventional boiler´s performance does not count with the heat generated by the gases, while condensing boilers do. 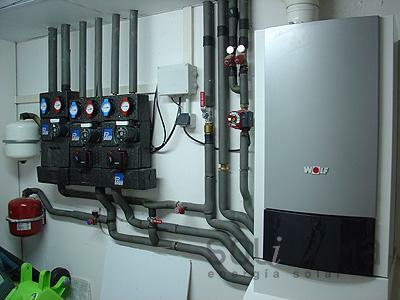 When this type of boilers is teamed up with radiant floor heating, the return water, in other words, the water from the heating system that returns to the boiler to be heated again, must be at a temperature no lower than 50ºC. This makes it ideal to combine it with radiant floor heating systems. What are condensings boilers ? Condensing boilers are based in condensing technologye, is called the phase change condensation of a gaseous substance to a liquid state. In this process some energy is released called latent heat. This latent heat energy is released or leveraging Wolf CGB boilers to increase performance, and therefore energy saving. By burning fuel generates an amount of highly energetic steam. In this convnecionales boiler steam is expelled along with the other gases to a temperature that can reach 180 º C. In the case of condensing boilers, the aim is to lower the temperature of these gases to condense and thus harness the latent heat is apparent. This is accomplished through a wide area of exchange in the boiler and a low return temperature, less than 50 º C.
Condensing boilers have an efficiency of 110% on the PCI-Calorific Power Interior, ie the amount of heat that can be produced from a fuel. This heat does not include the latent heat of condensation of gases generated during combustion. Is this the reason that condensing boilers have an efficiency greater than 100% over the PCI. Sund & Climate offers its customers the CGB Wolf model series, backed by decades working at Austria. These condensing boilers emit less polluting gases into the environment, helping to slow the destruction of the ozone layer and contributing to the conservation of our environment. Although until not long ago, condensing boilers were exclusively of gas. Now there are also condensing boilers diesel. • Seasonal Performance of 110%. • They are watertight and modulating air and gas. The furnace uses air from outside the boiler room, unlike the weather, which use inside the room where they are. 109% of performance. How can it produce more than consumed? The answer is very easy. Because, unlike other boilers, it uses the residual heat hidden in the smoke, that it is usually emitted to 400ªF or even more. Boilers that doesn't use this resource, cannot account with the heat achieved by recycling smoke heat, but condensation gas boilers do.